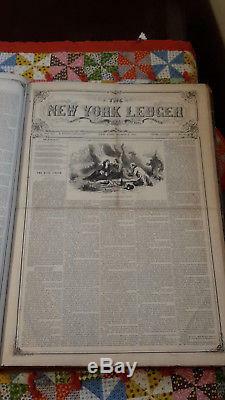 1860 to 1861 NEW YORK LEDGER BOUND NEWSPAPER SET This amazing bound newspaper set starts with March 10, 1860 No. 1 and ends with March 2, 1861 No. 52 THIS IS A COMPLETE ANNUAL YEAR SET NUMBERS 1 - 52! Full of advertising, chronicles and multiple mentions of the Republican party's presidential nomination of Abraham Lincoln During this time events included: 1860 Congress Accepting Pre-Emption Bill to free land in West for Colonists on March 12. March 28th The War of Waireka begins in New Zealand, also known as the First Taranaki War. April 2nd the first Italian parliament meets in Turin. The next day, April 3rd, the Pony Express was formed with a route between St Joseph Mo and Sacramento California and the first trip reached Sacramento on April 13th. April 6th, the Reorganized Church of Jesus Christ of Latter Day Saints was created. The 23rd of April saw the Democratic Convention in Charleston South Carolina. Thomas Jackson, later known as Stonewall Jackson, was assigned command of Harpers Ferry on April 27th. May 3rd Charles XV of Sweden-Norway is crowned King of Sweden. May 16-18th, in Chicago, the Republication Convention selects Abraham Lincoln as their candidate and is officially nominated on the 18th. June 3rd a series of Tornadoes completely destroyed the town of Comanche Iowa. June 23rd, the US Congress established the Government Printing Office. June 30th, Oxford University Museum hosted the famous debate on Charles Darwin's theory with arguments between Thomas Henry Huxley and Bishop Samuel Wilberforce. The first railroad reached Kansas on July 19th. August 3rd, the Second Maori War begins in New Zealand. Carl IV is crowned King of Norway in Trondheim on August 5th. Tragedy struck on Sept 7-8th when the Steamer "Lady Elgin" sank in Lake Michigan with a loss of over 300 people. Sept 20th, the Prince of Wales (later King Edward VII) made the first British Royal to visit the United States. Oct 13th, the 1st aerial photo was taken in the US from a balloon. Abraham Lincoln is elected the 16th American President on November 6th. Anaheim Township created in Los Angeles County on Dec 17th. South Carolina secedes from the Union. "Rip Van Winkle" premieres for the first time in NYC on Dec 24th. Dec 28th, Harriet Tubman arrives in Auburn New York on her last mission to free slaves after evading capture for 8 years on the Underground Railroad. 1861 President-elect Abraham Lincoln declares slavery in Confederate States unlawful on Jan 1st. Jan 6th the NYC Mayor proposed the NY become a free city, trading with both the North and South. Florida troops takeover Fort Marion at St Augustine. Mississippi secedes from the Union on Jan 9th followed by Florida on the 10th, Alabama on the 11th and Georgia on the 19th. Jefferson Davis resigned from the senate on Jan 21st along with 4 other southern senators. Louisiana secedes from the Union on Jan 26th. The State of Kansas was admitted to the Union as the 34th state on Jan 29th. Feb 1, Texas secedes which precipitates the American Civil War. Feb 4th, The Confederate Constitutional convention meets and elects Jefferson Davis to the President of the Confederacy. Feb 6th was the first meeting of the Provisional Congress of Confederate States of America and British Vice-Admiral Robert Fitzroy issues the first ever storm warnings for ships. Feb 8th, the Confederate States of America organizes in Montgomery, Alabama. Feb 9th, Tennessee votes against secession and Confederate Provisional Congress declares all laws under the US Constitution were consistent with constitution of Confederate states. The United States House unanimously passes a resolution guaranteeing noninterference with slavery in any state on Feb 11th. Feb 13th, Abraham Lincoln is confirmed and declared as the US President in Washington DC. Chiricahua Indians were attacked and defeated by Colonel Irwin on Feb 13th. Feb 18th, Confederate President Jefferson Davis was inaugurated at Montgomery, Alabama and King Victor Emmanuel II of Sardinia became the first King of Italy. Feb 20th, the Navy of the Confederate States forms. Feb 21st, Navaho Indians elect Herrero Grande as chief. On Feb 23rd the Dutch Premier Floris A van Hall resigned. Hard bound former library copy. Wear to edges, spine and pages noted. 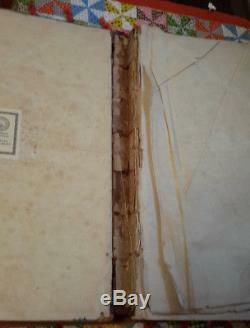 Front and rear boards are disbound however included, several pages are brittle. 1 was removed previously however is present. Item is the TOP book in the photo. The bottom is not included in this sale. The item "Bound New York Ledger 1860-1861 CIVIL WAR Abraham Lincoln Election" is in sale since Wednesday, October 10, 2018. This item is in the category "Collectibles\Paper\Newspapers\Pre-1900". The seller is "bunnydadof4" and is located in Cleveland, Ohio.